Winter is coming. And it gets cold! But you know what they say, there’s no such thing as cold weather, just inappropriately dressed people. Did someone say that? So while winter coats for kids can get a little pricey, oftentimes they’re worth the investment. Especially for those of us who live in extreme conditions. Whether your kids spend their winter on the slopes skiing and boarding, or prefer low key snowman-building and sledding – a warm, water resistant jacket is important. Not to mention, it’s a necessity for those of us walking to school or waiting for the bus! Our picks below trap the heat inside, keeping them outside. Check out some of our favorites. Lightweight and water-resistant, this coat is insulated with 600-fill-power Traceable Down. Available in other colors as well as girls’ styles. This coat is warm and compressible – which layers easily. Insulated with 600-fill-power Traceable Down. Available in other colors and patterns, as well as boys’ styles. Made of toasty warm down, this jacket features Down Defender – A technology that keeps fibers water resistant. Angel-Wing movement gives them full range of motion. Available in other colors, as well as girls’ styles. A 240-gram Farenhot synthetic insulation keeps them warm on the trails, and a removable faux fur hood adds the perfect touch for those who love to make a fashion statement. Available in other colors. A 550-fill goose down and water resistant fabric keep them toasty and lock in the warmth. Also available in girls’ styles. Waterproof and warm, with a 550 fill and detachable faux fur hood. Runs small. This water-resistant shell keeps kids dry on snowy or rainy days, while two-layer fleece keeps them warm and cozy. Also available in toddler sizes, and girls’ styles. This fleece-lined waterproof jacket features five pockets (including an interior goggle pocket and handwarmer pockets), as well as an interior media port. Other colors available. Snowboard ready, this jacket is water resistant thanks to the DryRide Durashell. Built for long tern use, it features a room-to-grow system, and a hood that fits comfortably over a helmet. Other patterns available. With L.L.Bean’s “warmer” rating, this reversible jacket is cozy, warm, and water-resistant. Also available in other colors, toddler sizes and boys’ styles. A reversible jacket? Yes! 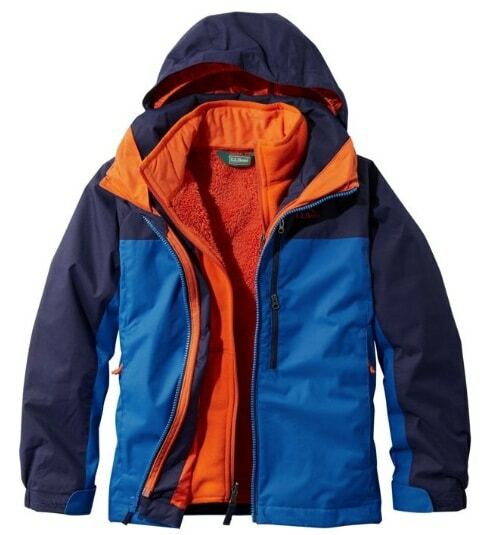 Two coats in one, with a wind-resistant exterior and soft fleece on the interior. They’ll be more than ready to hit the slopes with the interior goggle pocket, handwarmer pockets, headphone compatible chest pocket, adjustable cuffs with thumbholes, a fleece-lined collar and more! Water resistant, but breathable. ColdGear technology helps retain body heat to keep them warm, with a loose and generous fit. Faux fur trim is removable in case they aren’t feeling it. Made warm down fill, this coat also features banded cuffs, and an interior drawcord at the waist. All about Amazon Prime and need a warm coat on the double? A fleece lined (detachable) faux fur hood, fleece lined pockets and sleeves with cuff guards, make this a great warm, and water resistant option. Thermal reflective lining for warmth, with a fleece lined hood – and of course a media pocket. Slide Into The Weekend With The Best Sleds & Snow Tubes! Cool Stocking Stuffers For Teens And Tweens. For Real!